A wide range of technologies exists to convert the energy stored in biomass to more useful forms of energy. These technologies can be classified according to the principal energy carrier produced in the conversion process. Carriers are in the form of heat, gas, liquid and/or solid products, depending on the extent to which oxygen is admitted to the conversion process (usually as air). The major methods of thermal conversion are combustion in excess air, gasification in reduced air, and pyrolysis in the absence of air. Conventional combustion technologies raise steam through the combustion of biomass. This steam may then be expanded through a conventional turbo-alternator to produce electricity. A number of combustion technology variants have been developed. Underfeed stokers are suitable for small scale boilers up to 6 MWth. Grate type boilers are widely deployed. They have relatively low investment costs, low operating costs and good operation at partial loads. However, they can have higher NOx emissions and decreased efficiencies due to the requirement of excess air, and they have lower efficiencies. Fluidized bed combustors (FBC), which use a bed of hot inert material such as sand, are a more recent development. Bubbling FBCs are generally used at 10-30 MWth capacity, while Circulating FBCs are more applicable at larger scales. Advantages of FBCs are that they can tolerate a wider range of poor quality fuel, while emitting lower NOx levels. Co-firing or co-combustion of biomass wastes with coal and other fossil fuels can provide a short-term, low-risk, low-cost option for producing renewable energy while simultaneously reducing the use of fossil fuels. Co-firing involves utilizing existing power generating plants that are fired with fossil fuel (generally coal), and displacing a small proportion of the fossil fuel with renewable biomass fuels. Co-firing has the major advantage of avoiding the construction of new, dedicated, waste-to-energy power plant. Co-firing may be implemented using different types and percentages of wastes in a range of combustion and gasification technologies. Most forms of biomass wastes are suitable for co-firing. These include dedicated municipal solid wastes, wood waste and agricultural residues such as straw and husk. 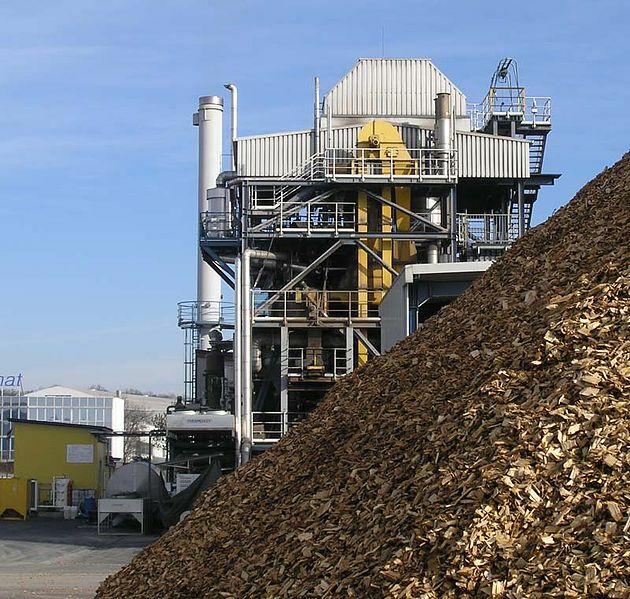 Gasification of biomass takes place in a restricted supply of oxygen and occurs through initial devolatilization of the biomass, combustion of the volatile material and char, and further reduction to produce a fuel gas rich in carbon monoxide and hydrogen. This combustible gas has a lower calorific value than natural gas but can still be used as fuel for boilers, for engines, and potentially for combustion turbines after cleaning the gas stream of tars and particulates. If gasifiers are ‘air blown’, atmospheric nitrogen dilutes the fuel gas to a level of 10-14 percent that of the calorific value of natural gas. Oxygen and steam blown gasifiers produce a gas with a somewhat higher calorific value. Pressurized gasifiers are under development to reduce the physical size of major equipment items. A variety of gasification reactors have been developed over several decades. These include the smaller scale fixed bed updraft, downdraft and cross flow gasifiers, as well as fluidized bed gasifiers for larger applications. At the small scale, downdraft gasifiers are noted for their relatively low tar production, but are not suitable for fuels with low ash melting point (such as straw). They also require fuel moisture levels to be controlled within narrow levels. Pyrolysis is the term given to the thermal degradation of wood in the absence of oxygen. It enables biomass to be converted to a combination of solid char, gas and a liquid bio-oil. Pyrolysis technologies are generally categorized as “fast” or “slow” according to the time taken for processing the feed into pyrolysis products. These products are generated in roughly equal proportions with slow pyrolysis. Using fast pyrolysis, bio-oil yield can be as high as 80 percent of the product on a dry fuel basis. Bio-oil can act as a liquid fuel or as a feedstock for chemical production. A range of bio-oil production processes are under development, including fluid bed reactors, ablative pyrolysis, entrained flow reactors, rotating cone reactors, and vacuum pyrolysis. Tagged Biomass, biomass conversion, Biomass Energy, biomass technologies, co-firing, Combustion, Fluidized bed, gasification, heat, heat treatment of biomass, power, pyrolysis, thermal conversion of biomass, thermal technologies for biomass, thermal treatment of biomass, thermochemical technologies. Bookmark the permalink. I’am very interested in this subject, it is only teurning to renewable energy particularly biomass that cave the world of pollution and degradation in nature. Thanks for your comment. Hope you enjoyed our website. which reactor is best for pyrolysis? or does it depend on the feedstock and desired end product?